We’re proud to present this entry in our popular Toothflix® 2.0 dental patient education video series – Taking Care of Your Teeth and Gums. All you need is a web-enabled device and you’re ready to provide patients with concise, easy-to-follow instructions for maintaining proper oral hygiene. For use both chairside and in the reception area, this video covers topics such as how to brush and floss properly and why it’s important to clean your teeth every day. This Toothflix 2.0 video includes detailed 3D renderings of dental issues and treatments, making it an essential tool for giving patients the information they need to improve their oral hygiene habits. By purchasing this video, you’ll gain instant access to it from your online ADA e-Bookshelf no matter where you are. 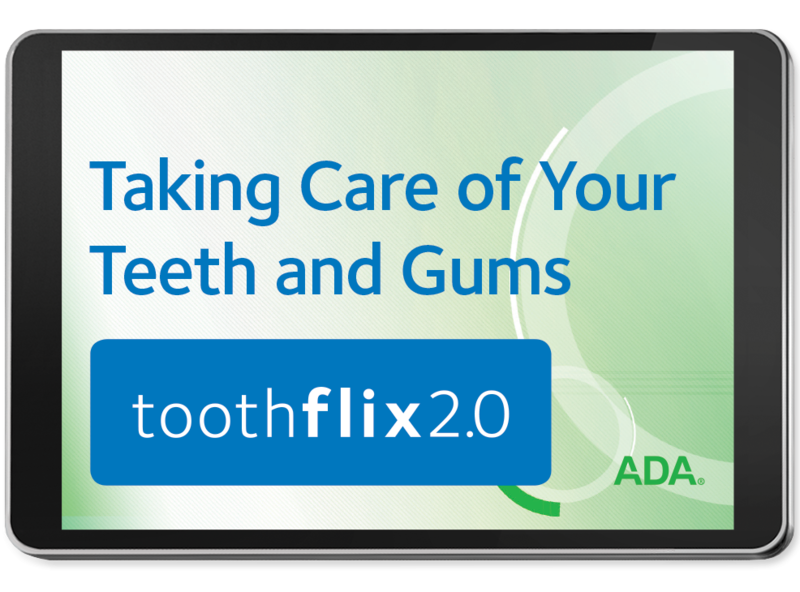 For more information about our Toothflix 2.0 line of videos, visit ADA.org/toothflix. Order your Taking Care of Your Teeth and Gums video today!